Los Angeles - It was a true Southern California celebration at the Los Angeles Tennis Open Sunday. Four of the six finalists at the annual UCLA tournament were locals: Sam Querrey from Thousand Oaks, Bob and Mike Bryan from Camarillo and newcomer Carsten Ball from Newport Beach. After competing as juniors, Querrey and Ball faced off in their first ATP singles final. Ball needed to win three qualifying matches before advancing into the main draw. “I thought of it as a regular old juniors match and just went out to have fun,” he said. “I knew Carsten had a huge serve. He’s got weapons. 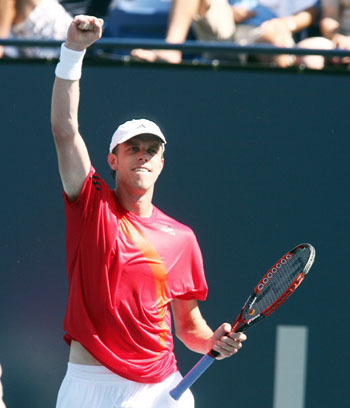 You just can’t break him one game after the next.” Querrey said he took a deep breath and regrouped for the third. “ I didn’t want to lose a third final,” he said referring to his recent two losses in the last two weeks at Newport, Rhode Island and Indianapolis. “Sam got a break in the third and that gave him confidence,” Ball said. “He had the better serve.” Back to back aces finished off Carsten Ball 6-1. 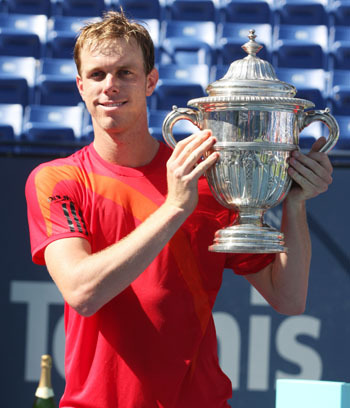 This is Querrey’s second ATP title and he’ll take home a paycheck of $100,000. Ball, the son of Australian tennis legend Syd Ball, got pushed into a new tax bracket, winning $50,000. But he wasn’t going to spend it all at once. “I’m going to put it into the bank and think about it.”. Mike and Bob Bryan are going to need a bigger sign at the Los Angeles Tennis Open next year. They are officially the "winningest" players at the annual UCLA tournament. A final ace cemented their record fifth title in a second set tiebreaker, 6-4, 7-6. “We’ve never lost a final here,” said Bob. 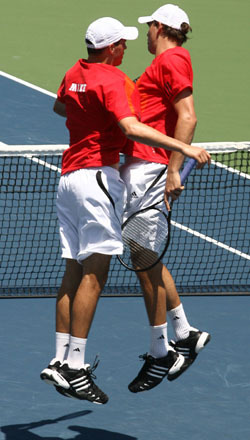 The Bryan brothers have won the most titles in the history of the tournament including singles and doubles. A large contingent of family, friends and neighbors, 80 strong, came from Camarillo in nearby Ventura County, including mother Kathy who they say “gets too nervous” to watch often. The 54th title of their career, the twin tennis terrors are working their way up to being the most successful doubles team in tennis history. Currently, the famous Australian duo “the Woodies” Todd Woodbridge and Mark Woodforde hold the record with 61 titles. 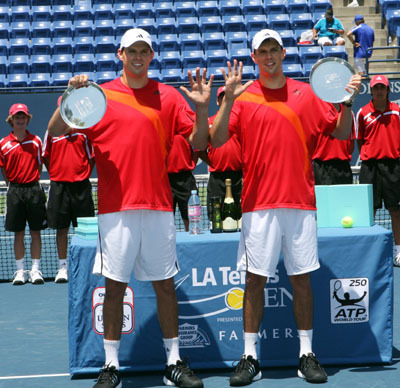 Their record fifth win at the Los Angeles Open this week isn’t the only record the Bryan Brothers are making. They’re also making an actual record. “Let It Rip” is scheduled to be released coinciding with the U.S. Open in New York the end of August. “It’s mostly fun for us. We’re just hoping the critics don’t rip us to shreds,” said Mike Bryan. The brothers say music is their second passion after tennis. Mike plays the drums. Bob is on keyboards and bass. And good friend David Baron at vocals, piano and guitar. The dynamic duo of tennis met Baron at one of their charity events and have become fast friends. Winning $31,900 in Los Angeles this week will help defray costs for studio fees they are incurring simultaneously. With Baron, the brothers have written six original songs for the album. They sing lead on one and background on the others. The highly successful doubles team says they use music to relax between matches on the tour.